It’s official: Santa Claus isn’t just coming to town. He’s stopping at every crate, doughnut-bed, and scratching post in the country. 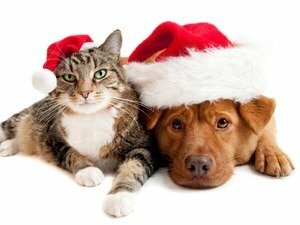 According to a recent DogTime/CatTime reader poll, a whopping 91% of pet parents plan to buy a gift this season for their dog or cat. The majority of them will even wrap it. And as if that wasn’t enough, 65% of furry family members get their own stocking, hung by the chimney — or at least safely out of pawing reach. In this feeble economy, perhaps most surprising of all is that humans are averaging about $30 a gift for their dogs and cats. With nearly 73 million households in the U.S. home to a pet, that’s a total spend of close to 2 billion dollars ($1,992,900,000!) on liver flavored gingerbread men and “I heart Brittany Spaniels Spears” tee-shirts.